Come out and find the finest local producers of cheeses right here in the Driftless Region. Also, We find the best ingredients that are right for us to do the job. Cheese only gets better with age. We ripen and age our cheeses right on premise; handcrafted in small batches-the flavor of our cheeses in unbeatable. Located in the rolling hills of rural Darlington is Brunkow Cheese of Wisconsin. Since 1899 Brunkow Cheese has been creating over 50 varieties of artisanal and specialty cheeses. In addition to making all of our cheese by hand in small batches, we also age all of our cheeses on site. Here at Brunkow Cheese, we take pride and dedication in handcrafting some of the finest cheeses around; from our aged cheddars and our flavored Jacks to our specialty cheeses and spreads. We are also the proud recipients of 15 (and counting) awards for our fine cheeses. 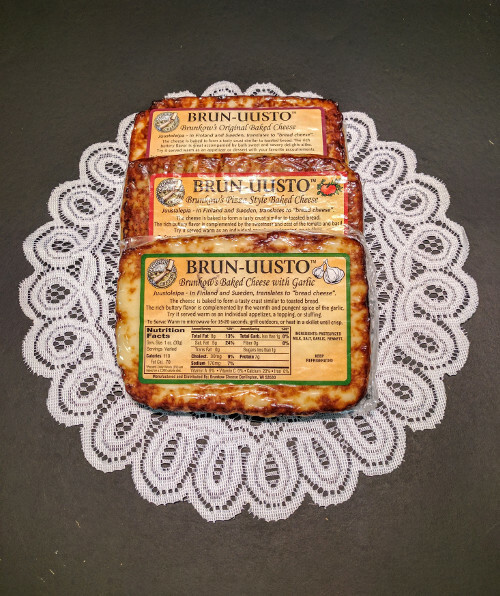 We have won “Best of Class” for our Brun-uusto Baked Cheese with Garlic, 99.3 in 2014 at the World Championship Cheese Contest. In 2012, we won “Best of Class” for our Raw Milk Cheddar with Horseradish, 97.75, again in the World Championship Cheese Contest. Click on the link below to view all our award-winning cheeses. This cheese is so TASTY! Really! You can take my word for it or purchase some yourself, it is absolutely, darn tooting, AMAZING!!! The curds were unbelievable. Squeaky all the way through! They had just been made, which was a cool experience to get something fresh. They were still warm. I bought the baked cheese, jalapeño, and the bacon, at the Texas State Fair this year. It’s gone, and I want more! It was awesome! Where OH where can I get more? Alternatively, you can call us on +608-776-3716. 17975 county hwy f darlington WI 53530 US Phone: 6087763716 Open M-F 8:00 a.m. – 4:00 p.m.